Walter I. "Walt" Jenkins IV is a member of the North Carolina State Bar. Mr. Jenkins was born and raised in Biscoe, North Carolina. 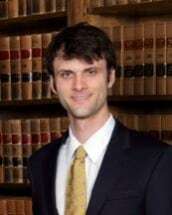 He received a Bachelor's of Science degree in Biology from the University of North Carolina-Chapel Hill in 2011 and his law degree from Campbell University School of Law in Raleigh, NC in 2014. While in law school, he served as President of the Intellectual Property Society and received the Book Award for scoring the highest grade in a course on Patent Drafting and Prosecution. Mr. Jenkins practices criminal law and civil litigation. He also handles Social Security Disability Appeals. Walt currently lives in Southern Pines. He enjoys spending time with his girlfriend, Erika, reading about science and history and loves to play disc golf in his spare time.